Toroidal Conductivity Sensor Head Precalibrated sensor head for conductivity and temperature. Plug & Play with any Datastick to yield accurate 24-bit data. 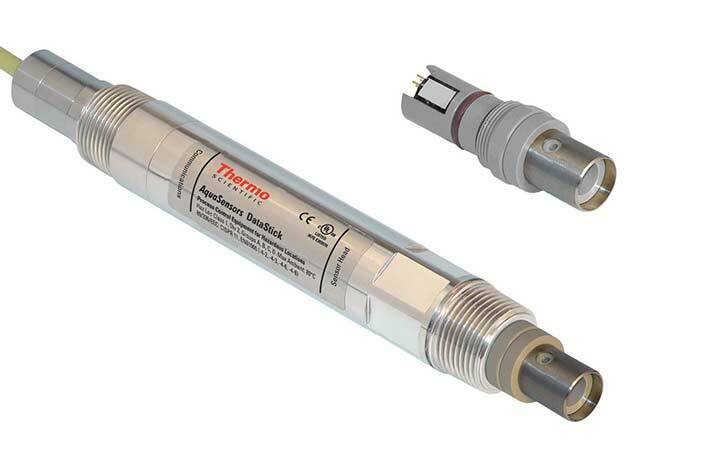 The Toroidal Conductivity Sensor Probe from Thermo Scientific provides highly accurate direct 24 bit conductivity data. The conductivity sensor heads are pre-calibrated with no field calibration required, providing a simple 'plug & play' system that is mechanically rugged and exceptionally chemical resistant. A wide range of plug-in communication adapters provide and array of connectivity options including Modbus RTU, DeviceNet, Profibus, USB, CANopen and Ethernet. Connect directly to a PLC (Programmable Logic Controller) for seamless integration with industrial control systems. Any computer can be used to display data, customize and calibrate the datastic system without the need for an intermediate analyzer electronics box. An integral temperature sensor automatically compensates measured values for changes in process temperature. The toroidal conductivity sensor's onboard electronics are completely encapsulated and O-ring sealed for complete protection from moisture and humidity, and the wall thickness of the sensor prevents cracking during heating and cooling cycles. Measurement Units µS/cm, TDS, % conc.